*Make a post, and link back to the blogger who awarded me. *Share seven things about myself. *Contact them to tell them they have won. 2. I once hated coriander leaves (cilantro for you northern hemispherians). The Cilanto Sour Cream recipe and Veganomicon brought me round, and now I can't get enough of the stuff. 3. I love necklaces. I feel nekkid if I don't have something around my neck. I have a large collection, but I haven't bought one for some time... this is sad, I must rectify this! 5. I help out with a fantastic group called Charlie's Angels Horse Rescue, which rescues horse and finds them forever homes, as well as running some great campaigns. 6. My favourite books are 'Pride and Prejudice', 'To Kill A Mockingbird' and 'The Great Gatsby'. Totally unoriginal, but shows that some good comes out of high school English classes. 7. I have been meaning to learn to knit for the past five years. I have needles. I have faux yarn. I have even had a lesson or two from a friend. But so far I haven't managed to take it up. Maybe this winter? Speaking of stylish... OK, so I know we are at the wrong end of the year to even thing about Christmas, but check out this little guy wearing a Santa hat. A few weeks ago someone had dropped off some stuff at one of our clinics with a cat they were surrendering (boo), including a little Santa outfit. It was a quiet afternoon, and we had Idexx, on of our adoption kittens, frisking around. He is very cute and sweet. How could we not! 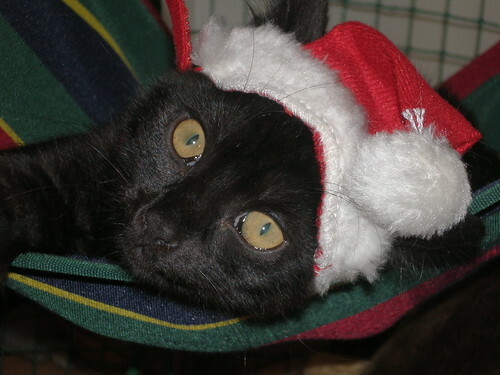 The fantastic thing about this santa hat, unlike mine, is that it has holes for their ears to go through, which is both super cute and much more stable and comfortable for the kitty. Little Idexx is a bit under the weather at the moment, but as soon as he's back on his feet he will be up for adoption from our Clayfield clinic, if anyone is looking for a sweet little forever kitty! Clearing out some more photos from the archives, this time from our beloved VWAV. Let's start off with a favourite - Brooklyn Pad Thai. 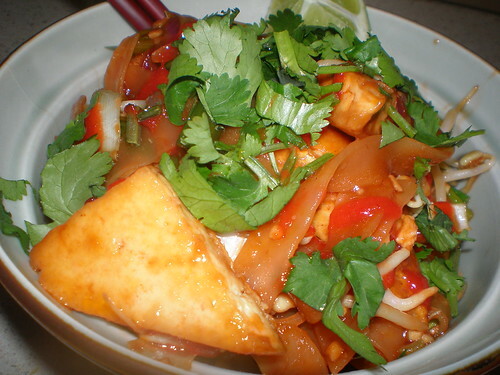 This is amazing, with a lovely and tangy sauce that will keep you coming back for more. Frying the cute little tofu triangles first give them a great taste and texture. If you can get the tamarind concentrate, definitely use it over the lime juice as it gives a better flavour, I think. The recipe called for one pound of rice noodles, but I only used 200g and it was enough for three to four people. On a cold night, the Stewed Tofu and Potatoes in Miso Gravy will blow your mind. This is one of my mother's favourites. Even though there are potatoes in it, I highly recommend taking Isa's suggestion of serving it over mashed sweet potatoes, so highly delicious. I also like to serve it with some steamed broccoli. Perfection! 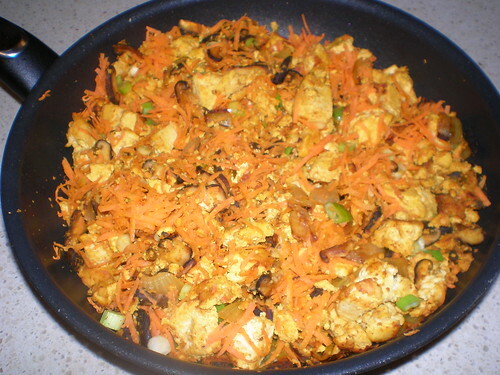 I have not been pre-making awesome breakfasts as much lately, but back when I had my breakfast mojo on, I made this Asian-Style Scrambled Tofu (one of the variations on the Scrambled Tofu page). I love shiitake mushrooms, and starting the day with them makes me a happy little morning bear. I probably served it with my standard of toast with avocado, but I hope to one day make it with the Sweet Potato Has with Five-Spice and Watercress... I'll let you know when I do! 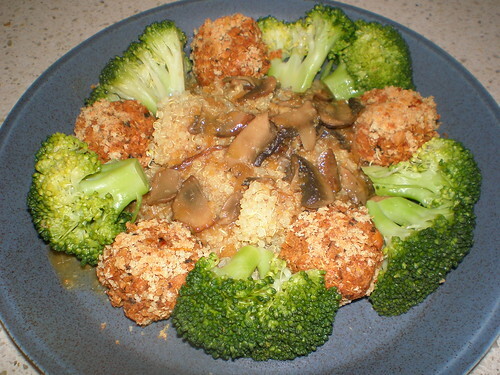 These Black-Eyed Pea and Quinoa Croquettes with Mushroom Sauce are super cute, and one of my first attempts at making croquettes. They were a bit fragile, and I had a bit of trouble getting the bread crumbs to stick, but they looked great. The mushroom sauce is delicious, though not quite as thick as I thought it would be. I took the suggestion and served it with a mound of quinoa, and also some steamed broccoli. The stars of this plate were definitely the vegetables courtesy of VWAV. First let us talk about Maple-Mustard-Glazed Potatoes and String Beans. Make sure to use the largest dish you have to bake it in, or it will take a bit longer to cook. The sauce is awesome. The white circular stuff is a Redwoods Cheatin' Turkey Loaf, which to be honest was not great... it was kind of watery and didn't have great flavour or texture. 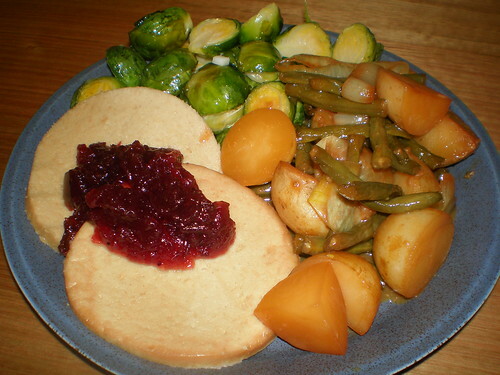 On top of it is cranberry sauce from a jar. But back to the vegetables. Roasted Brussels Sprouts with Toasted Garlic to be exact, which are SO yummy! Try and get the smallest sprouts you can for super cuteness. Sometimes the garlic doesn't always toast in five minutes, so it may just need a little extra. 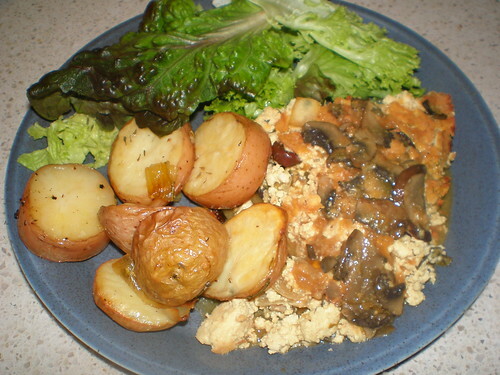 Back on the breakfast/brunch/lunch train - Mushroom Frittata with some extra mushroom sauce from the croquettes served with some Herb-Roasted Potatoes. The frittata is a variation of the Asparagus and Sun-Dried Tomato Frittata, and it is delightful. 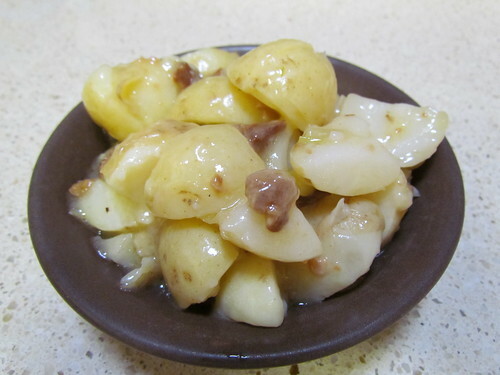 The potatoes are amazing, and so simple to make. I couldn't find teeny potatoes, so I sliced some small potatoes. Spicy Indian Rice with Roasted Almonds is full of flavour, the toasted almonds definitely make the dish. My mother was in love with this from first bite. I served it with some Braised Cauliflower with Three-Seed Sauce, which makes for a fantastic dinner. 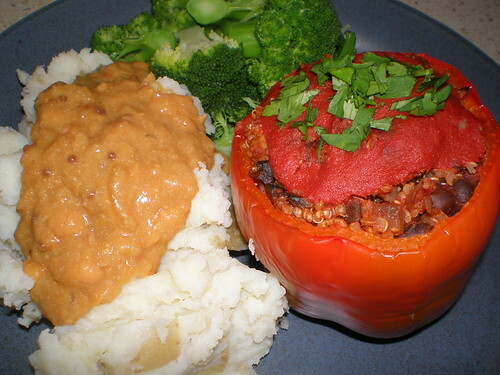 Black Bean, Mushroom, and Quinoa-Stuffed Peppers... I know what you are thinking... capsicum! I didn't actually eat the capsicum. I stuffed capsicums for my parents, and then I stuffed a little ramekin for myself. But one must take a photo of the capsicum! It does kind of look pretty. I served it with Mashed Potatoes with Punk Rock Chickpea Gravy. This gravy is the stuff of legends, and there was lots left over to use in all sorts of ways afterwards. So delicious! And some of that steamed broccoli as well. On to some desserts. 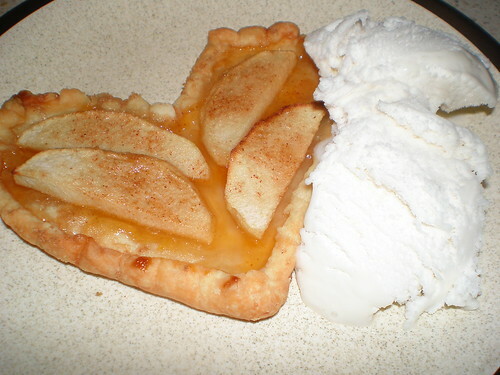 Gingerbread Apple Pie is very cute. I found that once it was cooked it seemed quite saucy still and it made the crust a bit soggy. But it was delicious, delicious goodness. Peach Cobbler is another good winter warmer (I type in the middle of summer). 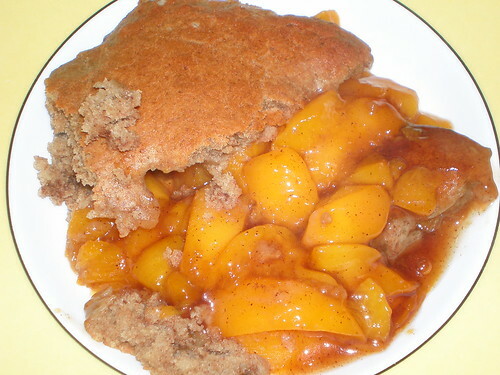 I really like this cobbler because the topping is not super sweet like some other recipes, it is just sweet enough to go so well with the peaches. And some soy ice cream! 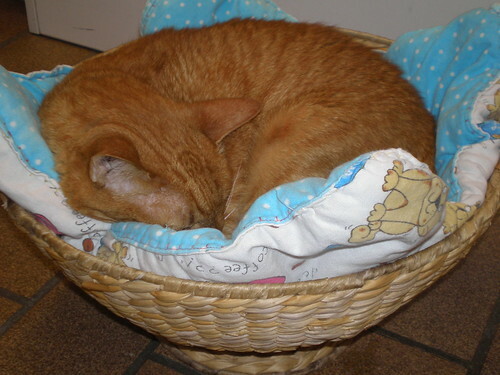 A Prince in his basket. I have spoken about Prince before, but a while ago. Prince is one of the old folks who we look after full time at one of our clinics. He is a Singapore street cat, and now his mum is back in Singapore. Prince now lives with one of our nurses, but comes into work with her each day because he needs a fair amount of supervision and care. He is very sweet. More fun things to share from 1000 Vegan Recipes by Robin Robertson. Every week I make my lunch to take to work with me. Lunch is not a set time or duration, it is something that I just squeeze in when I get the chance, so having something prepared and delicious really helps. Here are some salads and a couple of wraps that I have made and taken a long with me. 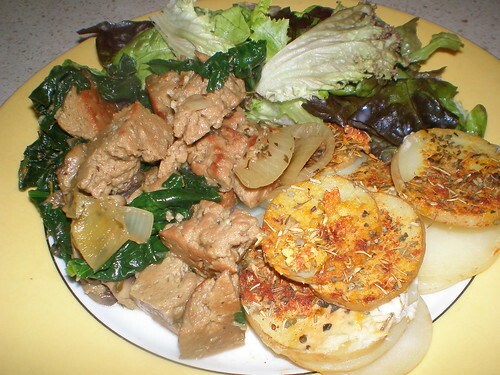 German-Style Potato Salad was a yummy sweet and sour salad. 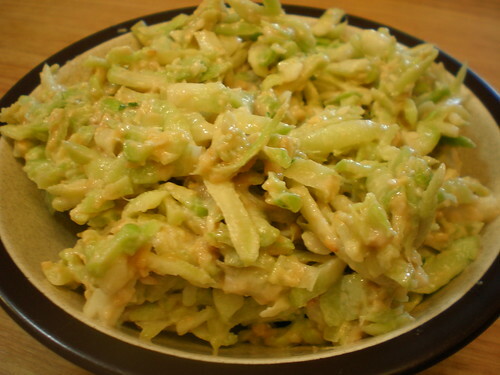 You cook the dressing - be careful not to cook it too long or it can go a bit gummy! The recipe calls for 1/2 cup olive oil in the dressing, but I decreased it to 1/3 cup with no problems and next time would probably decrease it even a bit further. 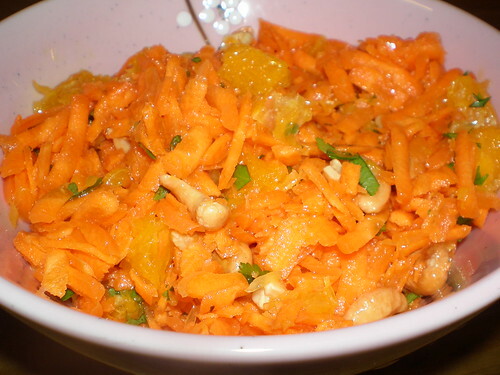 Carrot and Orange Salad with Carrots and Cilantro is a fantastic and refreshing combination. It keeps really well too, which I was a bit surprised about. It is sweet and nommy, and the cashews are fantastic... add more! 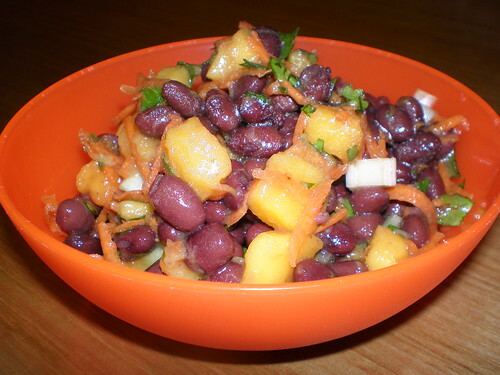 Tropical Black Bean Salad with Mango was full of promise but fell a bit short for me. After taking the photo I added a two cups of cooled brown rice and tossed through as suggested to bulk it up. There was not enough mango in here for me, next time I would use two... or maybe even three if I was adding the rice again. I like the Vcon version of this salad much better. This salad did live up to my expectations. 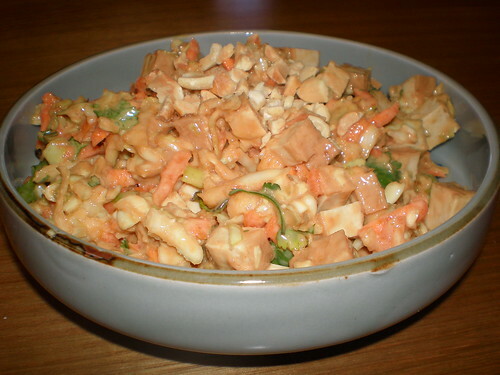 Chinese "Chicken" Salad is like an Asian coleslaw with a thick peanut sauce - delicious! When I took it to work I put some shredded lettuce in the bottom of the container, which was great. The book suggests serving in lettuce-leaf cups, which would be adorable. It would also be delicious as a wrap. 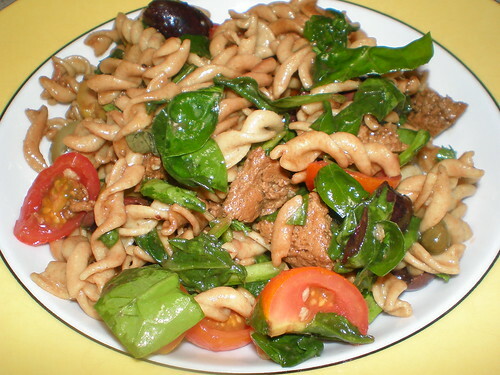 Puttanesca Seitan and Spinach Salad was one of my favourite salads. Seitan, olives, capers, spinach, garlic, tomatoes... how could it be wrong? 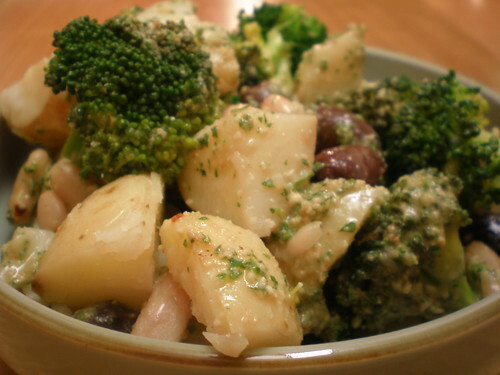 White Bean and Broccoli Salad with Parsley-Walnut Pesto was another winner, it was sooooo yummy. If you are not eating it right away, don't mix the nuts into the salad or they go soggy. Take them along to work in a separate container and add them on the day. Roaster Cauliflower and Rice Salad with Dijon Vinaigrette was yummy... it really did start an intense love of roasted cauliflower, it was a miracle any of it managed to make it into the salad! 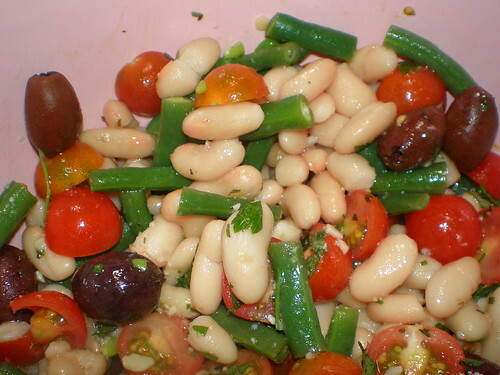 This is a crappy photo, but Provencal White Bean Salad is a great salad for packing for the week. The book suggests tossing through some cooked pasta or sliced potatoes, I just took it over some greens. Though now I think about it, sliced potatoes would have been so fine. 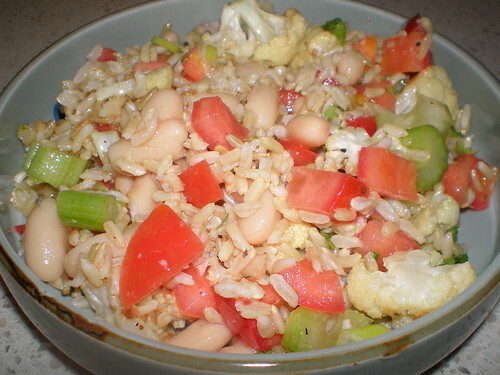 Sometimes the salad is enough on its own, especially if it is full of beans, pasta, vegetables, tofu or the like. Sometimes I make a sandwich or a wrap to take along as well to round out the lunch. I love this photo, if I may say so. I'm an average to crappy photographer of food, but every now and then one just works... and I think this looks beautiful. 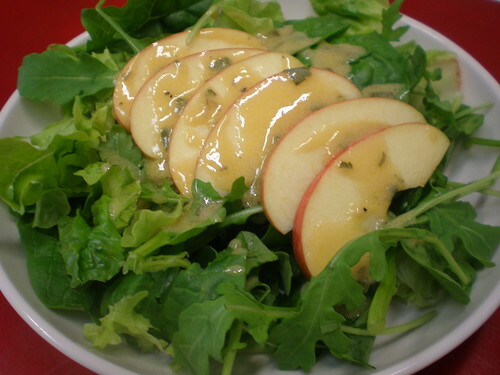 Arugula and Apple Salad with Creamy Mustard Dressing is a lovely salad. To take to work, take it in parts, the greens, the apple (tossed in a little bit of lemon juice) and the dressing and mix there. I only used 1/4 cup of oil in the dressing instead of 1/3 cup. The above is not enough to fill up my hungry lunch-time belly. 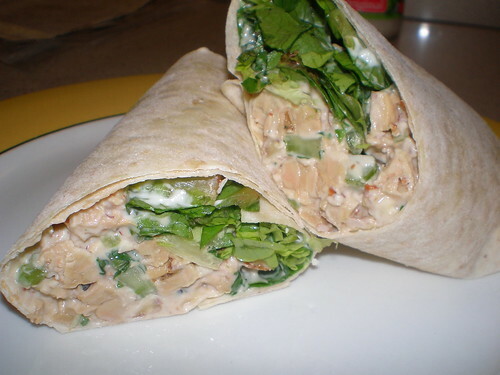 I also took along some Tempeh-Walnut "Chicken" Salad Wraps, which were great. The recipe called for 8 ounces of tempeh, but the blocks I normally get are 300g and I just used the whole block, and it was fine. This intriguing looking thing is Tahini Broccoli Slaw, using shredded broccoli stems instead of cabbage as the base of the slaw. Yummy! My love of broccoli stems continues to grow. The tahini dressing is very thick and very delicious. 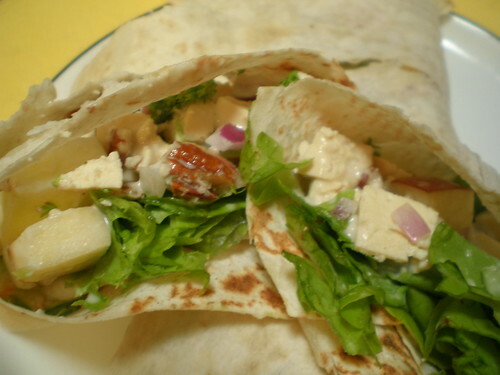 With the above salad I also took along some Tofu Waldorf Salad Wraps, correctly thinking that the sweetness of the wraps would be a nice counterpoint to the tahini dressing in the slaw. I used some of the Pureland soy mayo for this, which is already quite sweet, so if you are using this or another sweet prepared soy mayo then no need to add the sugar in the dressing. I also found that the amount of filling made enough for eight wraps using the mountain bread wraps I used, rather than the 4 wraps the recipe suggested. The recipe says use 4 10-inch tortillas, and I can't imagine the amount of filling would not exceed that as well. As I type this, I only have nine fingers at my disposal. On Monday at work a cat scratched the tip of my little finger on my right hand so bad and so deeply that some of the inside bits were poking through to the outside - OUCH! I went to the doctor, who put some sticky strips on it, but when I went back the next day for her to check it she decided it needed stitches. Now, I spend all day wielding needles, but point them towards me and I turn into a nervous wreck of terror. Local anaesthetic injections hurt like hell, it turns out, but at least after that I could not feel what she was doing. I now have three stitches in my finger, which I find incredibly disturbing and I cannot wait to hopefully get them out on Monday. Anyway, in the meantime I cannot get my finger wet or use it in any meaningful fashion. Annoying. This is Blaize. I have mentioned her before, she is one of our adoption kitties who has a bad heart defect, there is no way of knowing when it will take her. 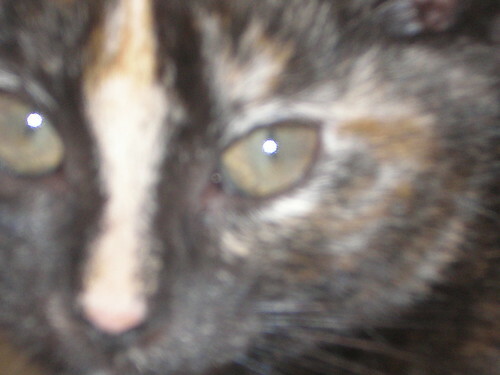 I am happy to report that Blaize is now over two, and recently came in for her yearly vaccination. She is doing really well in her new home, and has a little kitty sister now as well to play with. She is certainly having a wonderful life, hopefully fate will make it a long one! As I continue to catch up on my backlog of Things To Blog, these are the special dinners I made my father last year. I just discussed how my mother loves baked beans. Well, my dad likes apples, and you will see a few apple desserts coming up. My dad let me pick for his birthday dinner last year. I know he really likes seitan, so I chose The Vegan Ghost of Julia Child Menu from Veganomicon. The main course was Sauteed Seitan with Mushrooms and Spinach with Herb-Scalloped Potatoes. The seitan calls for 2 cups, but I have written here that I used a whole batch, which I think must mean that I used 500g (1lb) of seitan, as that is what I consider a normal batch size. The recipe calls for 6 cups of spinach, but it cooks down a lot so you can always add more for extra green goodness. The potatoes are good too, though they never seem to brown up quite as much as I would like. There seems to be a lot of liquid in them. The dessert was Individual Heart-Shaped Apple Galettes, which are SO CUTE! I was a bit worried that they wouldn't work out, but they were really easy and look adorable. They would be awesome for company. 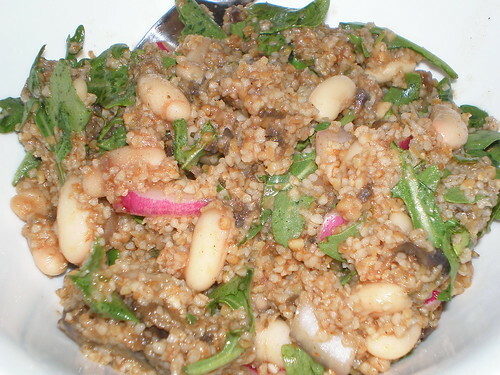 This is the Bulgur, Arugula, and Cannellini Salad. I did not actually make this the same night as my Dad's birthday dinner, but it is an optional part of the menu, so I thought I'd share it here with you. I made it to take to work for lunches. 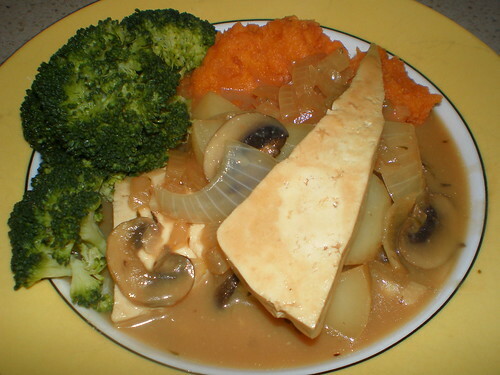 It is nice, but even better topped off with some marinated mushrooms or baked tofu - yum! 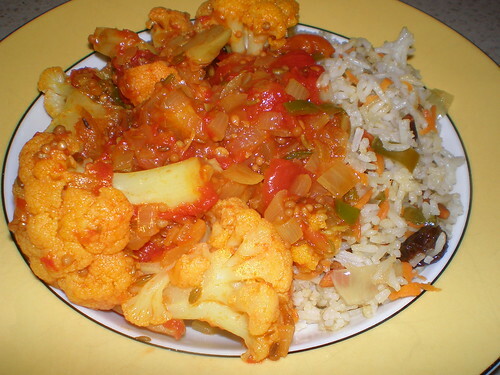 My dad also likes vegetable curries. He picked a red curry for Father's Day. I thought I might have a go at making my own curry paste, so I did. 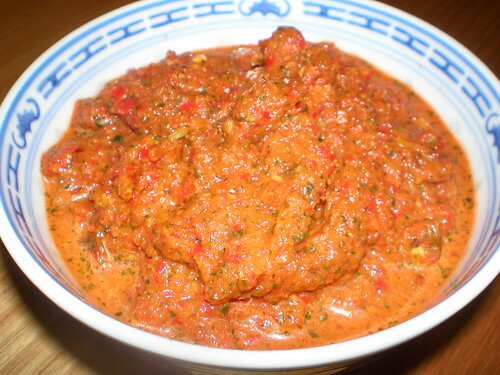 This is the Red Curry Paste from The Asian Vegan Kitchen. 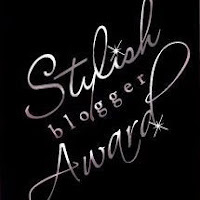 It was very easy to use, and looked so fresh and spectacular compared to the stuff from the bottle. 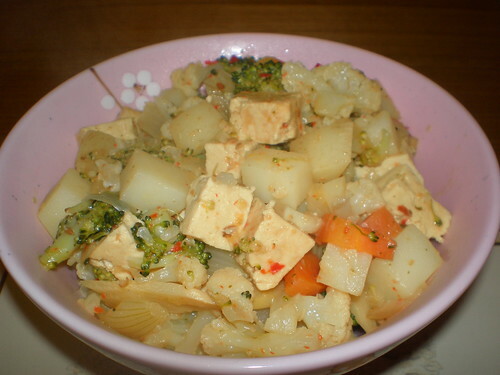 The curry paste went into Thai Curry With Veggies from The Vegan Table. The recipe says it yields 2-4 servings, but it seemed to make HUGE servings! I did add some additional broccoli to make it a bit more green, but still! Next time I would cut down on the potatoes, three potatoes seems excessive, especially when serving with rice. I also used carrots instead of red capsicum. 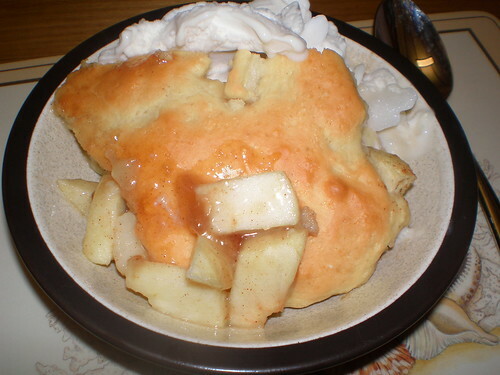 Dessert was the Apple and Pear Cobbler from 1000 Vegan Recipes, served with some soy ice cream. 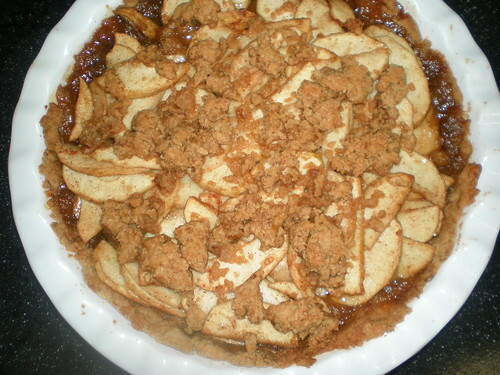 In this recipe I did not grate the apples, I just chopped them and it worked out fine. I would have like a teeny bit more of the topping mixture to spread over it. Not content with a birthday dinner and a Father's Day dinner, my Dad also wanted a cake! He wanted a dessert for his birthday dinner, and a cake for later. This is the Apple Lover's Cake from 1000 Vegan Recipes. This cake never really rose, it stayed quite flat and lumpy throughout the baking process. I also found I needed to add another teaspoon of juice to the icing to make it spread enough, but be careful as it gets too runny quickly. 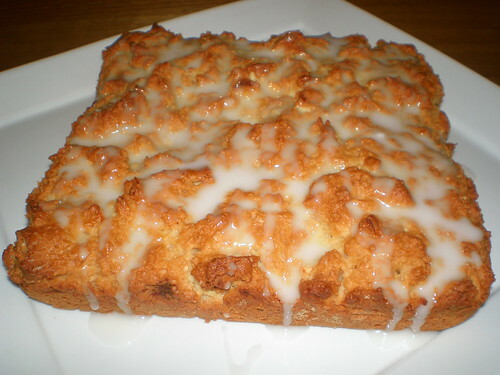 It has apple sauce, dried apple and fresh apple in it, plus apple juice in the glaze, so it is apples all around. The handsome Possum, being adorable in the garden again. 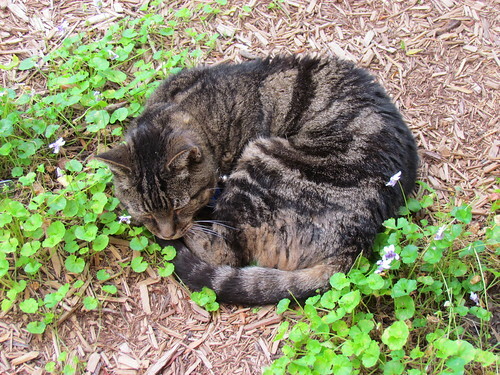 He loves lying in this garden so much, and snuggling gently up to the flowers. 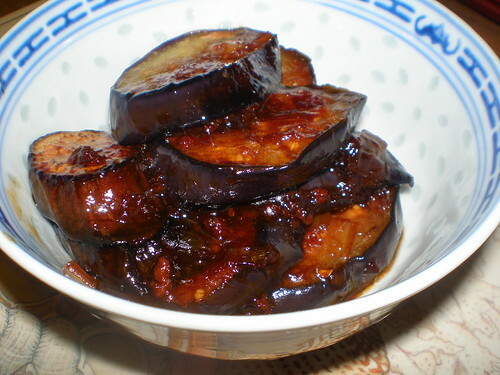 We started with Mahogany Eggplant from Vegan Planet, which I have made several times before, it seems to be a favourite with the family. 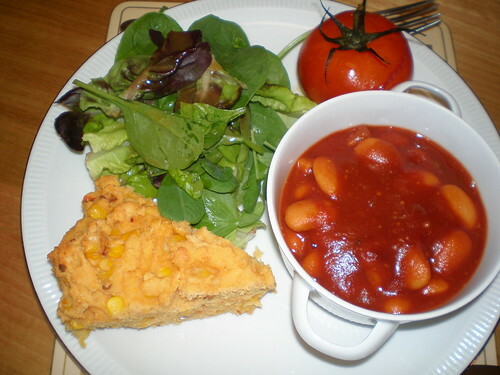 The main event (which will look very familiar to you by the end of this post) was Old Fashioned Baked Beans and Skillet Cornbread with Smoked Chiles from Vegan Planet, salad dressed with Cumin-Cinnamon Vinaigrette from Eat Drink & Be Vegan and a roasted tomato. This is my mother's favourite baked bean recipe. The cornbread is also really good, the chipotle gives it a wonderful smoky flavour without being overpowering. 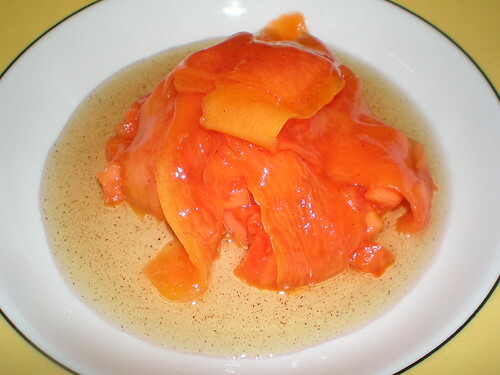 Dessert was Papaya with Vanilla Bean Syrup from a Donna Hay magazine. The papaya was meant to be peeled in long strips so you could make a pretty pile of ribbons, but it was a bit too soft for that so I ended up just cutting it up. A brunch was held, as is so often the case on Mother's Day. 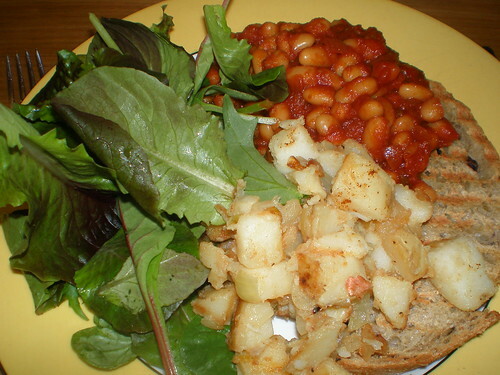 Yet again you see some Old Fashioned Baked Beans from Vegan Planet, served alongside some amazingly delicious Pan-Fried Spuds from 1000 Vegan Recipes, some salad and some delicious Olive and Thyme Sourdough toast from Sol Breads. 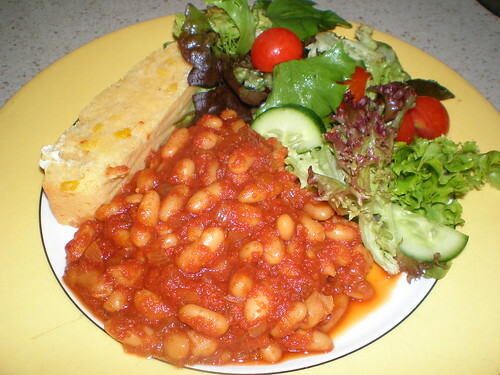 By now you recognise the Old Fashioned Baked Beans from Vegan Planet. This time it is served with a mixed salad and some yummy Double-Corn Skillet Corn Bread from Veganomicon. 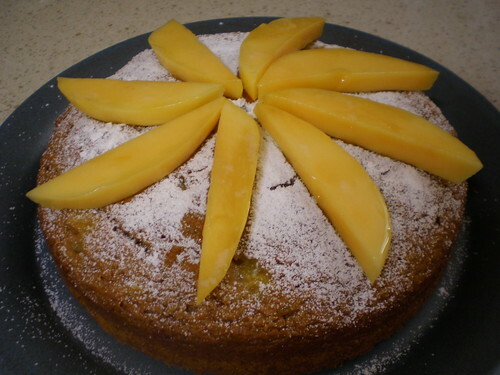 For dessert this time I had a free choice, so I made this yummy Mango Spice Cake from 1000 Vegan Recipes. The spice and mango blend to make a subtle but delicious taste, I really enjoyed it. The option in the book is to use some cream cheese icing, but I couldn't go past some fresh mango slices and a dusting of icing sugar. 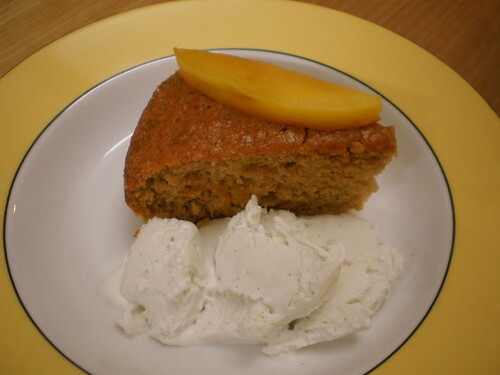 Here it is again, cut up and served with some coconut ice cream. Delicious! 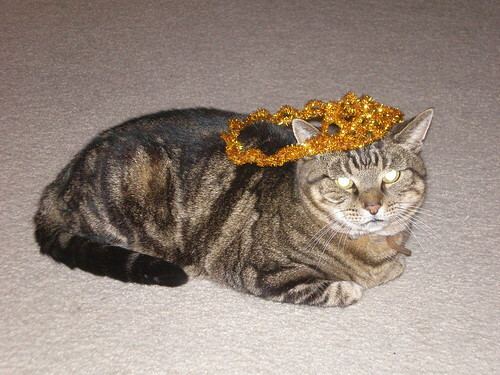 Here is Possum, celebrating Mum's birthday in style wearing a gold tinsel tiara. Very manly.